It is a rather unusual and eye-catching feature. In Martel Hall, you can always tell the first-time visitor. will see someone enter for the first time. Their eyes are drawn upward; they usually gasp. Clearly, the ceiling is not just a random set of squiggles laid down on a restaurant napkin. 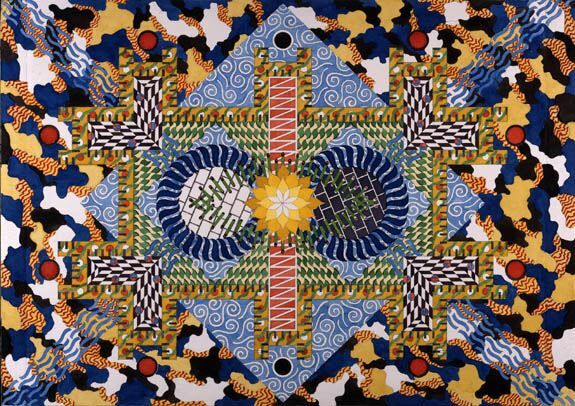 Outram wants the viewer to understand, intuitively and emotionally, that the ceiling has meaning. It is an object intended to provoke thought; to cause both residents and visitors to stop and ponder. The ceiling tells a story-a cosmological, philosophical story. Outram has told several versions of the story, the interested reader is encouraged to visit his web site. We have recorded an abridged version of one such explanation. 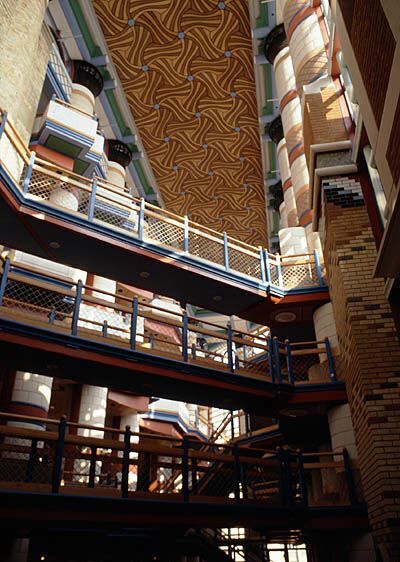 For a contrast, consider the ceiling of his Judge Institute at Cambridge. Here, the ceiling consists of a series of closed irises, revealing only a hint of what lies beyond. One parent's reaction to the ceiling surprised me. He was concerned that we had "wasted tuition money" on such frivolous art. Two facts about the ceiling calmed him. First, the ceiling was generously donated by Steve and Sue Shaper, of Houston. Thus, no tuition dollars were spent. Second, the ceiling was produced using cost effective techniques that are, to my knowledge, novel in the realm of architecture. Outram drew the ceiling as a line drawing on a single sheet of paper (A1 size). He colored in the drawing. The drawing was scanned using a 1200 dpi scanner. It produced roughly 750 megabytes of data. The scanned image was enlarged into a set of 232 two-foot by eight-foot panels. The panels were printed onto oversize sheets of perforated vinyl using a twelve-dpi, acrylic-ink printer, called (I believe) a Scanachrome printer. The vinyl sheets were mounted onto two-foot by eight-foot acoustic ceiling tiles (fairly standard acoustic ceiling tile). The wrapped tiles were shipped to the site and mounted, using small brackets, to a vault made of the standard aluminum T-channels that normally hold up a lay-in acoustic ceiling. The result is a striking and inexpensive decorated ceiling, produced for a cost that is less that the cost of the roughly 400 door handles in the building. Anytime you take an A1-sized sheet of paper and blow it up to a size of roughly fifty-five by seventy-five feet, you should expect to find some scanning artifacts. Several such artifacts can be seen in the ceiling. Dirt, too small for the human eye to notice on the original, shows up on the final ceiling. Similarly, several small pencil marks can be found in the lighter colored regions of the ceiling.